Who can you trust to clean your home from top to bottom in a professional and thorough manner? Sears Maid Services offers experienced and reliable home cleaning services you can trust. All our locally operated cleaning teams have experience in both commercial and residential cleaning. Whether you need a one-time deep cleaning or regularly scheduled cleaning services, you can count on Sears Maid Services to provide excellent and skilled cleansing of your kitchen, bathrooms, hallway, living areas, dining areas, and playrooms. Our trained staff cleans everything from ovens to toilets and even tackles especially difficult cleanup tasks like the inside of microwave ovens, ceiling fan blades, and baseboards. Give us a call at (619) 599-4870. Would you like to schedule a regular home cleaning service? Sears Maid Services offers schedules for cleaning that are convenient for you and your busy life. 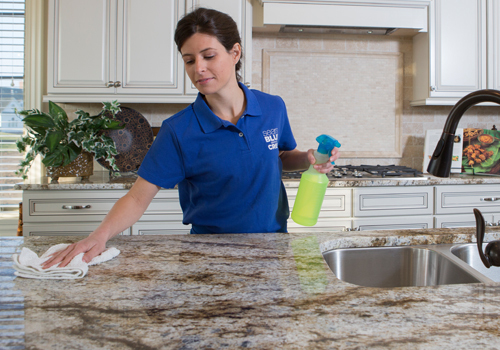 With weekly, bi-weekly, or monthly schedules, Sears Maid Services can service a variety of homeowner needs. Do you wish you had time to do a spring cleaning of your home? We also offer a special Deep Cleaning service that you can schedule once or twice a year. Let Sears Maid Services handle those home cleaning tasks that are more daunting along with giving your home a full top-to-bottom cleaning. A clean, well-ordered office space is impressive to clients, vendors and workers. Businesses with dirty and untidy offices not only present a poor image of a company, they also demoralize workers. Additionally, unsanitary bathrooms and office spaces can contribute to sickness and absence among workers. The professionally trained employees at Sears Maid Services can be counted on to keep your business expertly cleaned and well-maintained. With a trained staff of professional cleaners, Sears Maid Services will take care of your dust, kitchen mess, bathroom germs, and full wastebaskets. After the drywall is finished, carpets are laid, fixtures are installed, and painting is completed, newly constructed homes generally require a thorough cleaning. Frequently, construction companies use a cleaning service to prepare the home to be shown to realtors, inspectors, and potential buyers. Sears Maid Services offers licensed and trained professional post-construction cleaning. Our trained teams are experienced in cleaning up construction debris and preparing a new home to be shown. We will remove all of the mess left by the construction, wash all surfaces, clean floors and sanitize the home. Our first guarantee is that Sears Maid Services is professional and trustworthy. We realize excellence in the cleaning industry requires not only expertise in residential and commercial cleaning, but also developing relationships with clients. We know that you need to trust the people you invite into your home or business to clean. All members of our team are given a background check and rigorously screened before being hired. In addition, we carefully scrutinize each potential employee's references. Moreover, new employees receive extensive training in the procedures and skills of Sears Maid Services cleaning techniques. By giving training both on and off the job site, we ensure that our cleaning technicians are prepared to clean to Sears Maid Services' standards. Our second guarantee is that you will be satisfied with our work. Find a problem? Give us a call within 24 hours of your cleaning and we will send someone to inspect the work. If we find something Sears Maid Services missed, we will fix the problem at no cost to you.